"Between A and B" or "from A to B"
Both questions are protected (as one can see from the revision history). 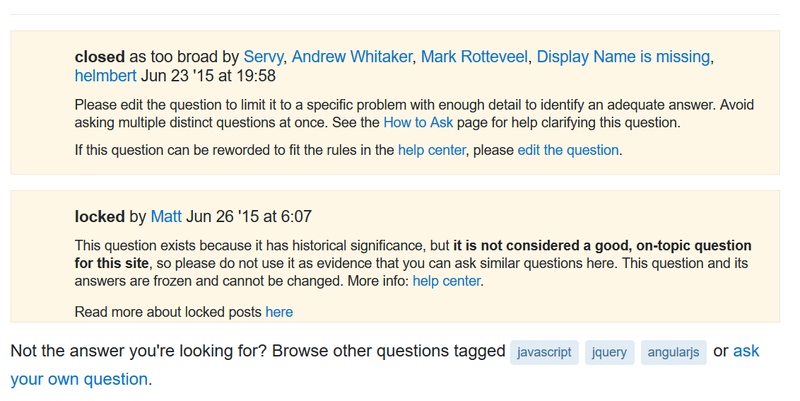 For the first question (the meta one) I see the protection banner directly below the question. On the latter question I saw nothing, so status-reproduced. This is a bug. I can't answer a protected question due to low rep AND I don't see that it is protected. I think this may be related to some clean-up work being done. Please revert this change. This should be fixed now. The root cause was some work done to reduce overhead on page loads: cruft that'd built up over the years. The "special status" banners for questions have to be identified, prioritized and rendered fairly quickly as they're shown to almost everyone. Unfortunately, this work ended up papering over one of those annoying exceptional cases: the Protected banner is shown at the bottom of the page (in lieu of the answer form) for folks who can't answer protected questions. This was formerly accomplished by triggering the banner rendering twice, once with the carefully curated list of special statuses, and then again - for low-rep / anonymous users only - with a list containing just the Protected status; after the change, it got called twice with the same parameters. Now we're back to doing it the old way in spirit, but instead of generating lists on the fly they're populated once. Also, since it's readily available... We can check to ensure that there aren't any other, more important statuses already being displayed before jamming that Protected notice at the bottom - this takes care of a long-time annoyance wherein the Protected banner would tell people they needed 10 reputation to answer... Even if the question was also closed and locked. Big thanks to Adam Lear for digging into this & working up a fix!